CMHA has two large telemedicine video systems, one in the east and one in the west, which have been used primarily for educational and administrative events. This year we received two additional clinical telemedicine video systems for the Primary Health Care offices in the East and West to use for Telemedicine Clinical Events. Telemedicine uses video cameras and monitors to connect clients to specialists who are not located near to them. This reduces travel time and expense for our clients. During a Telemedicine Clinical Event, clients can see, hear, and talk to their health care professional, just as they would in a face-to-face appointment. examine their ear, nose, and throat. 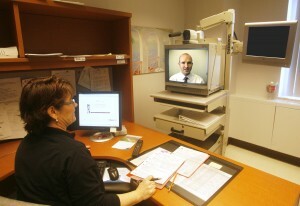 From January to April 2012, CMHA conducted 94 Telemedicine Clinical Events totaling 3,940 hours. We have formed partnerships with several specialists through telemedicine and the number is growing. Examples of clinical use include a regular clinic with a psychiatrist for our Mental Health and Justice and Court Support Programs, ongoing consultations for our clients with a pharmacist providing support for smoking cessation and various community specialists using our telemedicine video systems, which include a GP Psychotherapist, Respirologist and Physiotherapist.